Today I had the pleasure of serving as a volunteer at the Massachusetts Oyster Project's placement event where 50,000 oysters purchased from Island Creek Oyster were placed into the Boston Harbor. The volunteers formed into teams to start placing oysters into structures that were later placed on the bottom of Boston Harbor. Measurements were taken on several of the oysters and then the cages and equipment were handed off to divers who placed them below the low-tide line. Towards the end of the day, additional oysters were dropped from a boat in carefully identified areas. Oysters filter and clean water. The hope of today's event is that the oysters will contribute to the cleaning of Boston Harbor. More information is available on the Mass Oyster Project blog and website. 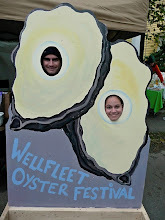 To contribute to the Mass Oyster Project click here or contact them at massoyster@gmail.com. Here is a link to news coverage by the Boston Herald. Here are few more pictures from today. Here is a video that captured the day. Josh is far too modest. He worked hard at this event hauling blocks, moving equipment, his talents go way beyond writing. Let the Oysters Flourish! Thanks Andrew. I was glad to help out. The video came out great!